Engage in professional learning programs that promote teaching excellence and leadership. Design learning experiences that meet the needs of all students. Find factsheets, handbooks and other useful support guides. ECU Change Framework (detailed version in downloads). To fulfil our vision “to be recognised for our world ready graduates and leading edge research”, we need to develop an organisation which is change ready. This means that we must be proactive in attracting, developing and managing staff who are able to adapt to change rather than only reacting to the needs of the work force when we progress through change. See ECU Change Framework. The Change Framework is a tool which can assist managers to develop a change ready workforce. 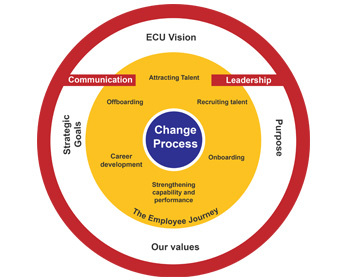 The inner circle (Change Process) of ECU’s Change Framework allows Leaders, Managers, Supervisors and Staff to engage with change, for continuous improvement, in four easy to follow phases namely Pre Engagement, Engagement, Enablement and Embedding. Each phase provides an overview of Activities, Resources, Professional Development and Support that could be used in any change initiative. As change is seen as a constant, ECU views the way we manage change as a holistic process. To facilitate change effectively, we need to follow an inclusive approach that keeps people engaged and energised. Together with the alignment of organisational structures, we need to ensure that we have appropriate systems and processes in place in order to build capability of our people. The combination of these essential components are required to manage and sustain the desired change. It’s important to stay focussed on the desired outcome; most of all, we need to “be the change we want to see” - Mahatma Ghandi: The Great Soul of India. At this stage, the organisation will be aware that change will take place and work will be undertaken to get ready for implementation of the change. Business Case/Project plan signed off with Exec Sponsor/Decision-maker approval. At this stage, the change is implemented and staff are beginning to engage in the new ways of working. They are building new skills and beginning to understand new processes and systems. Organisation Development Team Coaching (contact ODT). At this stage, the change has been implemented and staff are becoming proficient in the new ways of working. Organisation Development Team Coaching (contact OD). To lead change well, managers rely on highly developed leadership skills. Further resources and assistance can be found on the Management and Leadership Resources page.